G.K. Chesterton was an incredibly influential, prolific English writer. He wrote many books and short stories, thousands of essays, poetry, and even plays. He was a newspaper columnist for several London newspapers and even wrote entries for the Encyclopedia Britannica. His Father Brown mystery stories are still very popular. In this book, Paul Nowak has gathered biographical details and anecdotes about Chesterton into short stories about "Uncle Chestnut" as a means of introducing Chesterton to young readers. 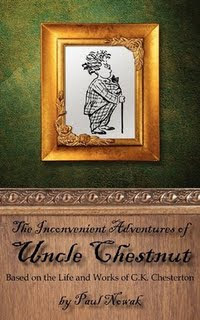 This slim paperback volume includes four of these stories, and is intended to be the first in a series of tales about eccentric Uncle Chestnut, as told by his nephew. I read this book out loud to my daughters, ages 8 and 10. The book opens with a rather rambling introduction to the narrator's uncle, which told rather than showed much of the information presented and led to my younger daughter's asking, after several pages, "Is something exciting going to happen soon?" Despite the slow beginning, they enjoyed the book, although they wished for more illustrations. Their favorite story was "The Easy Job," in which the two children learn a lesson they won't soon forget. I found the setting to be a bit confusing. At first it seemed set in Chesterton's time, with the trains and the hat he wore, but then there were modern references - to Indiana Jones and American Idol, for example - that seemed at odds to the late 19th-century, early 20th-century tone of the beginning of the book. One chapter, however, sparked an interesting discussion with my children. Uncle Chestnut scoffs at the notion of "believing in oneself" as a means to achieve success, pointing out the foolish hopefuls who perform on American Idol and make idiots out of themselves because, while they indeed have belief in themselves, they are utterly lacking in talent. Instead, he says, it is important to believe in something more important than oneself in order to truly make a difference. It's always a good thing when a book engenders discussion about things that matter. This book is clearly a labor of love on the part of the author, Paul Nowak. Here is an interview with the him at Starting Fresh, and another at One Person's Journey through a World of Books. In the Shadow of Mount TBR: "...it’s very much a needed book and voice of wisdom and reason that could tip the balance a little more toward sanity than it’s been leaning lately." A Reader's Journal: "This is a book that I will reread many times. One time uplifted my spirits and taught me much, but I will needed to be reminded frequently." Starting Fresh: "While the book wasn't to my taste, I expect that it will appeal to many children and parents." I love the idea of a Chesterton biography for young readers! But yes, I can see why the modern references would feel out of place. Loved this little book and look forward to the next. I'd like to know more about the discussion between your daughters on believing in self. I thought that was an important kernel to ponder. Nymeth - It did feel a bit as though it wasn't quite certain what era the book wanted to be set in. But yes, it's a great idea! Booklogged - As I remember, there was some debate about the importance of believing in yourself PLUS practicing and cultivating your talent - not blind belief. I'd personally hate for my girls to hesitate to take chances because they're afraid they might look foolish. Belief can only take you so far without discipline and skill, I'd say. But skill and talent and discipline without belief won't get anyone very far. We agreed that it's true that believing in something bigger than yourself is really important, too!